Cards by America: It's Buttons for Simon Says Stamp this week! It's Buttons for Simon Says Stamp this week! If you are here looking for the CURRENT House-Mouse & Friends MC Challenge, please scroll down two posts, or Click HERE to go directly there. If you are here looking for the CURRENT Midnight Madness Sketch Challenge #MMSC128, please scroll down one post, or Click HERE to go directly there. Check out Simon Says Stamp Store HERE!!! Check ou t the wide range of Buttons available at SSS HERE. 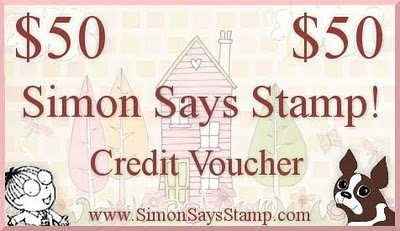 Heidi will be giving one lucky entrant a $50 voucher to her FAB Superstore Simon Says Stamp!! For tutorials, inspiration and candy, check out the great Simon Says Stamp Blog HERE. The Design Team arew showcasing Basic Grey products this week. I started with this new EK Success BUTTON border punch and went from there.... I liked it all by itself, but then got busy dressing it up with matching buttons and pearls and stickles... now you almost cant see the actual button border there anymore! LOL! For more inspiration, check out the rest of the amazing BUTTON creations by theFABULOUS Design Team over at Simon Says Stamp Challenge. Thanks so much for stopping by today! I really enjoy hearing from you! Oh my goodness, America this is a beautiful card! I love the layout and the buttons are so gorgeous! America...so very awesome, both the GDT and the card! Way to go! wow what a gorgeous card america and what a gorgeous image I love it. Morning sweetie - hope you are well!! What can I say - this has just blown me away, the design, colourrs, embellishment are stunning and your mousies don't be bettered by anyone!!! Just love it all. Can't tell you now happy we are you are joining us as DS!!! Oh my ! This is just adorable!!! Love thar row of buttons and lace! I have so many HM stamps and would use them more if I could color them like this! Thanks for the inspiration!! Your card is so pretty! I love all the color! Wow!! What an intricate card! Gorgeous. Thanks for playing at The Ribbon Carousel!! Gorgeous creation America, I love this image. Thanks for joining Oldie But A Goodie challenge, good luck. Oh America, your card is gorgeous!! There are so many wonderful things to look at and I love how you used the buttons on the border. I really love your style and am so excited that you are joining us this month on Simon Says Stamp. Your blog and cards are very inspiring!!! Gorgeous! OH my gosh, I love your buttons, and that edge punch is very cool! thanks for playing along with CMM!